Research suggests that as many as 12.7 million people in the UK could be financially squeezed; people who have significant financial commitments but little capacity to cope with sudden changes to their financial circumstances. Looking beyond the statistics, the human cost of low financial capability is acute. We know that the cognitive load of trying to get control of their money affects peoples’ ability to deal with other challenges in life. That’s why we launched Open Banking for Good (OB4G), bringing organisations and people together to create and scale solutions around Open Banking that will improve financial capability in the UK. OB4G was born from the Inclusive Economy Partnership, a collaboration between business, civil society and government departments. 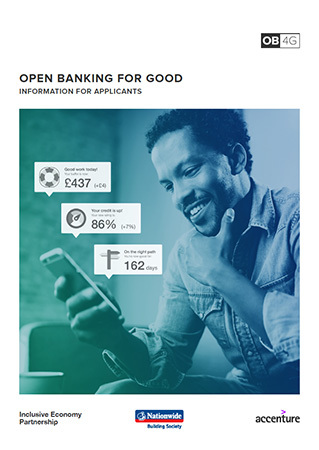 At its heart is a big goal: to use Open Banking to solve some of society’s biggest challenges, creating apps and services that improve financial capability for the one in four households who are struggling financially in the UK. Nationwide Building Society has worked with 17 charities and organisations to identify three key challenges for OB4G to address: Income and Expenditure; Income Smoothing; and Money Management and Help. We’ve asked fintechs and other organisations to come up with ideas and solutions that address these challenges, and that could help improve the lives of the financially squeezed using Open Banking technology. Nationwide has made £3 million available to fund the delivery of these solutions. The OB4G seminar was held in London on Thursday 8th November, 2018. You can watch a short highlights video of the day below, or you can visit the OB4G YouTube channel and watch all of the videos taken on the day. There are also additional specific challenge resources available below the highlights video. Please note that subtitled versions are coming soon. Applications are now closed, but the Information for Applicants guide is still available for you to use as a resource if you have an interest in OB4G.